Excellent reporting in today’s NYT on whether welfare reform worked as well as almost everyone says it did. The conclusion, as we’ve stressed in lots of recent work at CBPP, is that it is at best a fair-weather ship: it only appears to work when there’s lots of job opportunities for the low-income, single parents. In other words, TANF (Temporary Assistance for Needy Families) has lost its critical counter-cyclical function—its ability to expand when jobs disappear. And since it is at its core a safety net program, designed to catch economically vulnerable single-parent families when jobs disappear, the loss of that function means sharply increasing economic insecurity for families with kids in periods like this one. This is neither just an academic point nor simply a program evaluation of a big policy change. It is a stark warning about what happens when you turn a federal function over to states, through so-called block grants. They lose their sine qua non, their automatic ability to expand when most needed. And Republicans from Romney to Ryan have pledged to do the exact same thing with the rest of the safety net, including Medicaid and Food Stamps. The data in support of this contention—block grants eviscerate counter-cyclicality—are extremely clear and compelling. This figure, from the NYT piece, contrasts the performance of TANF and Food Stamps, the latter of which remains a federal program (now called SNAP, Supplemental Nutritional Assistance Program). 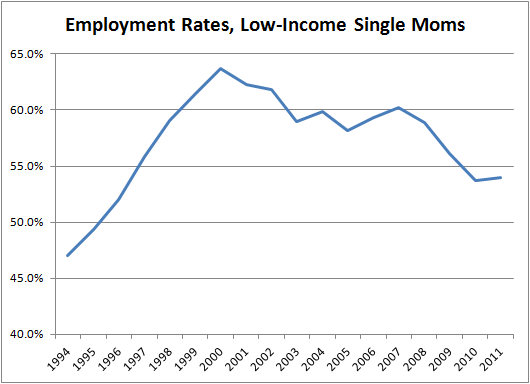 Note how they move together in the 1990s recession/jobless recovery but sharply diverge after that (SNAP goes up consistently in the 2000s because despite the expansion, low-income jobs were not forthcoming and poverty rates generally rose in those years). The figure below is equally revealing, showing the employment rates of low-income single moms (those with incomes less than twice the poverty threshold, from this post on this same theme). They went up strongly in the latter 1990s, and there’s little question that welfare reform played some role in this expansion, though full employment (the key factor), much expanded wage subsidies (the early 1990s increase in the EITC), and the higher minimum wage were also in play. But they peaked in the latter 1990s and have been coming down since. If welfare reform is so effective at putting people to work, why did it seemingly stop working 12 years ago? Because it’s architecture is that of a fair-weather ship—take the wind of full employment out of its sails and it founders on the shoals. And in this shipwreck, women and children don’t get away in the lifeboats. To the contrary, they risk drowning. …TANF’s annual block grant funding level has been frozen since its creation 15 years ago and has lost 28 percent of its value to inflation, with the decline growing larger with each passing year. Required minimum levels of state funding for TANF (under what is known as the “maintenance-of-effort, or MOE, requirement) have fallen in value by 28 percent, as well. At least they’re not using it for tax cuts. But the result is the kind of activities noted above that moms have to engage in to feed their kids. Read the piece and see if you recognize America in there…it’s getting harder and harder to do so. Share the post "Your Safety Net on Block Grants"
7 comments in reply to "Your Safety Net on Block Grants"
I too found the NYT piece very well reported and very timely. And I agree with virtually everything you and your CBPP colleagues say. But I’m not persuaded that Arizona isn’t using TANF money for tax cuts. The state has been cutting business taxes for some time and approved another round last year. It seems to me that the state would have a harder time reducing tax revenues if it didn’t use TANF funds to shore up programs that have more political support. 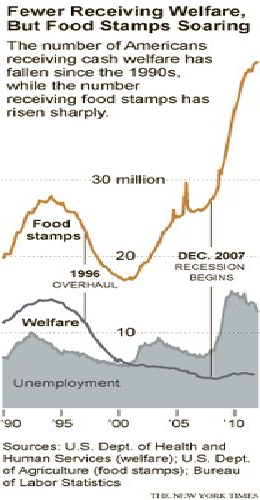 This was made possible by the conservative Democrats; it was proposed by Bill Clinton. The same faction to which Obama belongs, which controls the Democratic Party, and which, in coalition with the Wall Street Republicans, now governs the USA and will probably do so for at least the rest of the decade – that is, if the Tea Party Republicans don’t simply take over. This is why I couldn’t vote for Clinton in 96 and is related to why I’m not sure I can vote for Obama now. I know these guys are just the figureheads on a ship they can’t quite control, but it is infuriating to have the leaders of the Democratic party, the party that helped create Social Security and Medicare, now talking about cutting back even more on an already shrinking safety net. I might be able to put up with war on Eastasia and handing money over to rich bankers and destroying the environment–but then to take food out of the mouths of poor children? We live in a sick society. Indeed. What the right and their willing Democratic accomplices are doing is terrible. What this country sorely needs is a leader who can point out where policies of this kind will lead us. Of course, Obama will now run as a populist who means to look out for the 99%, but I’m not convinced. Where has he been? My impression is that Obama and the Dems are being pressed very hard by the corporations. “Nice economy there. Be ashamed if anything happened to it.” It doesn’t help, at least in the sense of fixing things, but if that’s so, we might be able to open up some space for our allies in a position to act. But we need to figure out who is on which side, and that is not going to be easy. When TANF was enacted, Congress and Clinton specifically set it up so that former recipients wouldn’t be tracked. They didn’t want to know what happened to people and, once they were out of the welfare system, they disappeared. But the problem is starting to show up other places–for instance, the increase in infant mortality and low birth weight babies, which happens because girls who were malnourished as children are more likely to have problems in pregnancy as adults.